William Elliott A Life with Blindness: How Do I Spend My Days? How Do I Spend My Days? I am often asked, "How do you spend your days?" I guess people often think blind and visually impaired sit around doing very little. My day often begins early in the morning. I often wake at about four or five in the morning. I get up and make a cup of tea. Listen to the radio, I listen to Radio 4 from the B.B.C. most of the time. Apart from during the change in time zones caused by the change from Standard time to Daylight savings time the Beeb is usually eight hours ahead of us here in California, so I can often hear the noon news from London and all programmes thereafter. After a drink of tea and allowing my guide dog Leif out to relieve, I usually go onto my computer. Look at the e-mail, read up on stock market news. I have been an avid follower of the stock-market for about forty years. I play a little at investing and am always looking for news about new ideas. After that I might have breakfast, or I may write a blog post for an hour, sometimes something in the news will catch my attention and I may write about that or I may go to my zazzle store and design a couple of items. By then it may be mid morning, I sometimes take a bus downtown to go to Starbuck's or to the TV studio. Riding the bus downtown and back takes about two hours so there is time for thinking and planning ideas. Leif and I may also go for a walk around local streets and just ponder for a while or I may make my way to my various doctors for appointmments. I only occassionally eat a lunch, I may spend the early afternoon calling various people and discussing ideas or I will return to my computer to check on sales of books through my Amazon bookstore or create some more designs for my zazzle store. After my wife returns home from work at about 5pm. We may take Leif to the dog park, with the lighter evenings this is much easier, and Leif gets to enjoy a swim in the dog parks swimming pool to cool down. After dinner around 7pm I may watch a recording of the Jeopardy quiz show before returning to my computer to answer e-mails, or create some more ideas on zazzle or check on my next shipments for amazon. Sometimes though an evening might be spent in the TV studio either working on my own project or helping others with their programs. Evenings are also the big time for my involvement with California Council of the Blind committees, I am a member of three groups two at my local chapter and one with Guide Dog Users of California (GDUC). Day to day things can vary a lot. Some are packed and more hectic others thankfully the majority are more even paced and relaxed. But this is the way I spend most of my days. For now anyway. One of my latest products from my zazzle store. 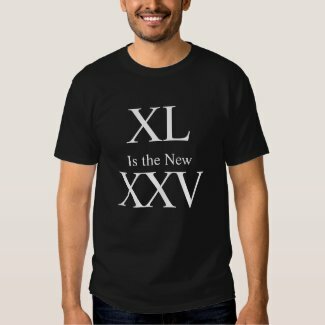 A t-Shirt which says in Roman Numerals "XL is the New XXV"
Make a custom print t-shirt at zazzle.com. How Do Blind People Know What Money They Have?